P. K. Gautam is Research Fellow at Institute for Defence Studies and Analyses, New Delhi. Click here for detail profile. It took billions of years for fossil fuel to form, but humans are likely to consume it all within 400 years. The pace of consumption today is leading to excess carbon in the atmosphere, which is exacerbating the process of climate change. It is common knowledge that, if the entire humanity was to consume according to the standards of developed industrial economies, it is unlikely that the available resources will be sufficient to even satisfy the minimal basic demands of all. 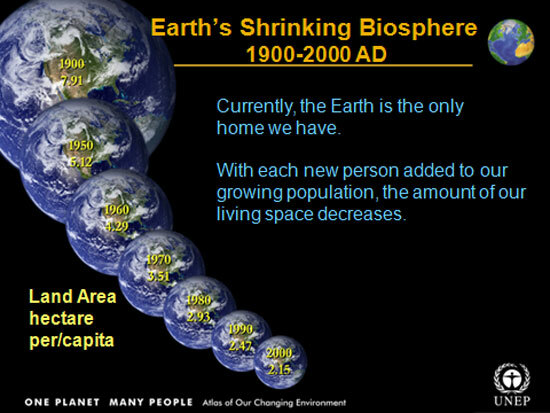 The earth’s shrinking biosphere will not be able to satisfy the human needs. In other words, the ecological footprint due to rising population and expectations will be more than what the planet can support. That is to say, mankind may need resources of more than one earth to support itself. This is shown in the following picture created by the United Nations Environmental Programme (UNEP) for the 20th century. In Indian philosophy there is a concept known as Trivarga, which deals with the notion of Dharma (moral ethics), Artha (material well-being) and Kama (desire). Artha is basically about growth and development, the fulfilment of material and economic needs, at least the meeting of the minimum needs of the poor and to an extent those of the rich. Kama is desire and expectation of a good life. But there seems to be no end to human desire, with frugality and simplicity losing their value. It is in this context that the concept of Dharma needs to be invoked as a new moral ethic for creating awareness and some form of regulatory mechanism that could balance both Kama and Artha. If we control our desires to manageable levels, resources can support mankind in a sustainable manner. This is also understood as want limitation. Gandhi and the Rudolphs are right. But the question is how does the balance of Kama, Artha and Dharma play out? Anthony Parel, in his edited volume of Hind Swaraj, refers to Gandhi’s postulate to ensure the continuity of Indian civilisation: “artha and kama should be pursued within the framework of dharma. In modern civilization artha and kama, according to Gandhi, assert their autonomy from dharma.”2 Gandhi clearly urges that Dharma must reassert itself and not be overpowered by Artha and Kama. It is to the credit of Gandhi that he explained the whole issue in such simple terms using the ancient Indian vocabulary derived from the concept of Trivarga. There is a new concern on how the international community would be able to cope with problems or risks that are inter-linked and often feed into each other. The first major problem is growing population and along with it an aspiring and consumption-oriented middle class. How can limited resources, both renewable and non-renewable, meet the rapidly growing demand for consumption? The second problem is resource scarcity, compounded by environmental degradation (some of which may be irreversible) and the looming threat of the adverse impact of climate change. Geoengineering technologies such as carbon capture and storage and solar radiation management are yet to be tested. While research on the technological options must be pursued, what is also important is simultaneous demand-side management and want limitation as part of lifestyle changes. It is time that an understanding and balance between the concepts of the trivarga be used to address lifestyle changes by making the concept of dharma central to the matter. Through such an approach, environmental and developmental issues can be balanced with ecological sustainability. At the national level this can be part of our education system, which should emphasise upon the need to curtail and regulate excess want. Concepts such as trivarga where Dharma is supreme can be integrated in school text books on social and environmental science. Simultaneously, the government should take steps to advocate and publicise at the global level dharma’s centrality in the trivarga as part of a campaign to evolve a new global norm for coping with climate change. 1. Lloyd I. Rudolph and Susanne Hoeber Rudolph, “Gandhi and the Debate about Civilization,” Economic & Political Weekly, Vol. 50, No. 30, July 25, 2015, pp.78-82. 2. Anthony J. Parel, ed., Gandhi: Hind Swaraj and Other Writings (New Delhi: Foundation Books, 1997), p. 66. See editor’s note 122. 3. “India’s Intended Nationally Determined Contribution: Working Towards Climate Justice,” Submitted to UNFCC on October 1, 2015, p. 1.